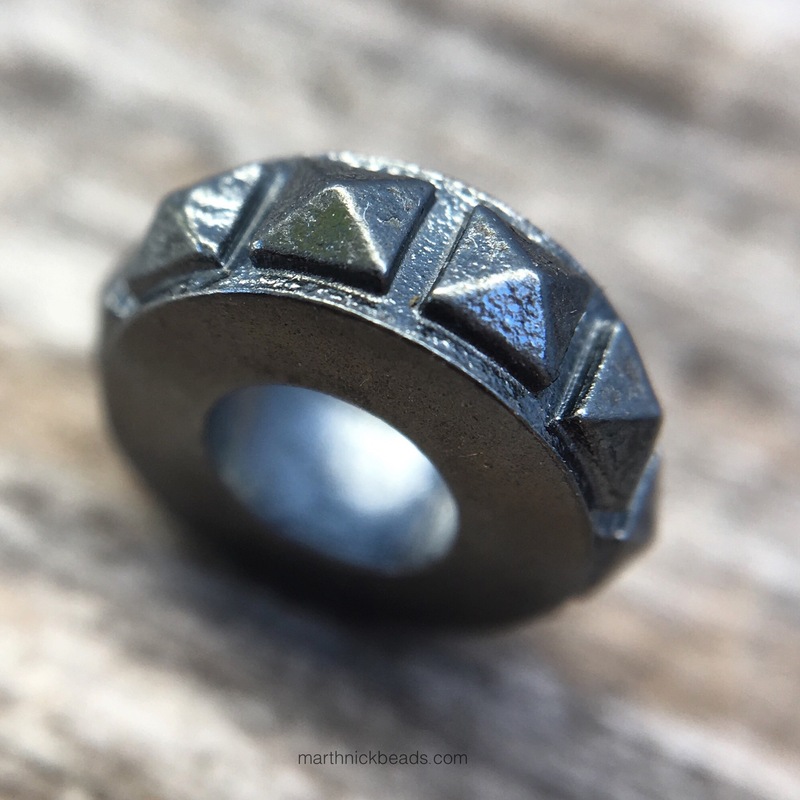 Along with the release of Dark Shadows, 3rd Edition are some new spacers with Black Ruthenium plating effect that give a blackened aesthetic (to paraphrase the description on the Ohm Beads website). To me they sort of look like they are coated with thick oil and I love them! I’ve got three here today and you can see the other three on the Ohm Beads website. Here’s an overview, with Mech Tech on the top, Chained on the left and Hot Topic at the bottom. Mech Tech has an industrial look. And Hot Topic looks like studs. 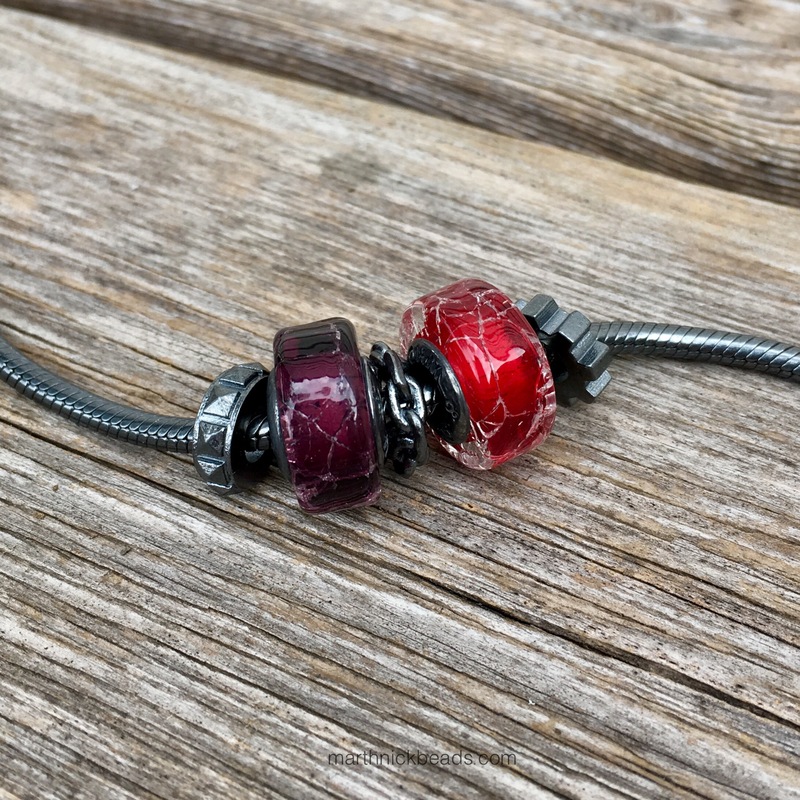 I tried them with a couple of the beads from the Bee Ohm Collection, Work Together on the top and Please Survive on the bottom. Even though I love glass I really enjoy an all metal look every now and then! Here they are in between a couple of Blue Holes. This also gives you a better idea of size. To me, most beads look huge onscreen then when they come in the mail I’m often surprised by their size. Since most of us purchase online, I think it’s really important to know what you’re getting! And say, if anyone would ever like to see something you know that I have with a certain bead, just let me know and I can post it here or on my FB page. I love to help people with bead shopping, ha! 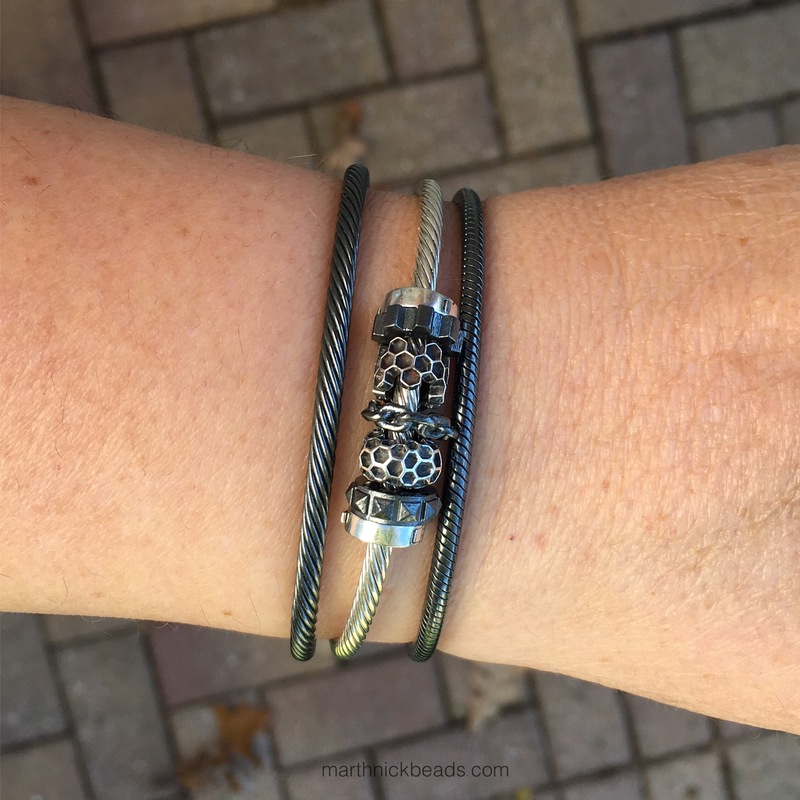 Here’s a look that I absolutely love…the Dirty Bracelet with the spacers and two of the new Dark Shadows glass beads, Royal Blood on the left and Broken Heart on the right. Lastly, I enjoyed using Mech Tech and Hot Topic on a mini bracelet with Widget, As Above, Jiangshi, So Below and Cranium. 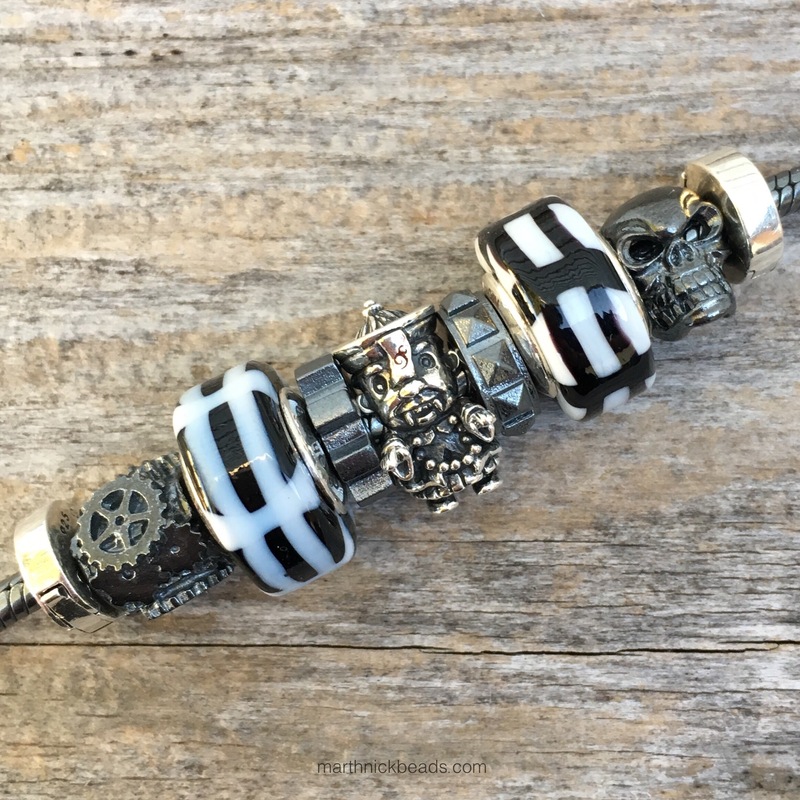 I think these are great pieces to have as options for a little interest in between beads. I’ll be using them a lot with the other Dark Shadows beads and look forward to trying out more combos with them. Does anyone else think they’d be useful for their collection? 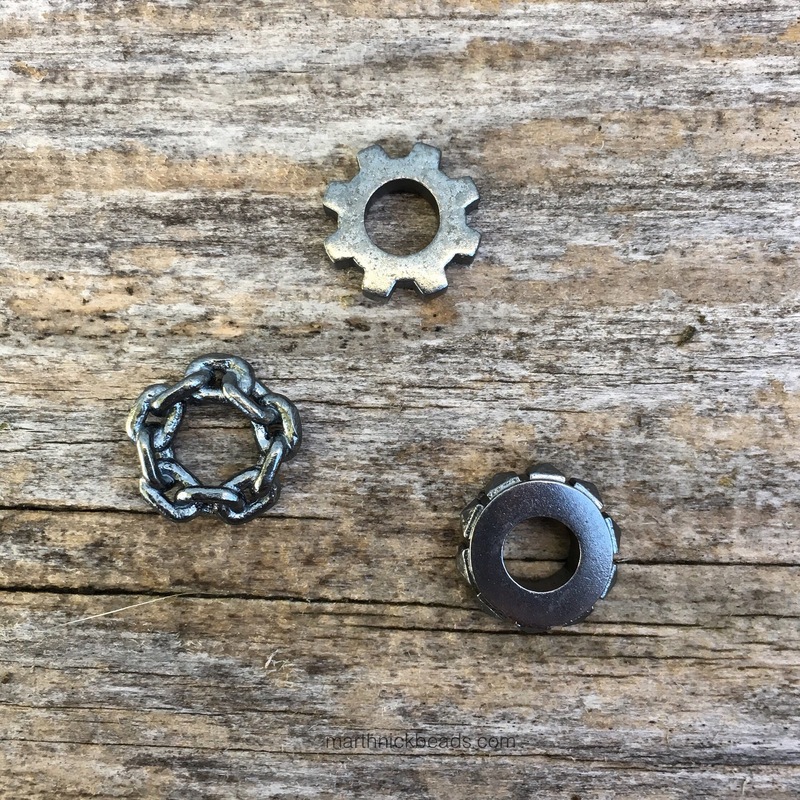 These spacers are very cool! Yes! I was wondering if you’d like them! I really like the mechanical, “darkened aesthetic” too, and they look great with Royal Blood and Broken Heart! 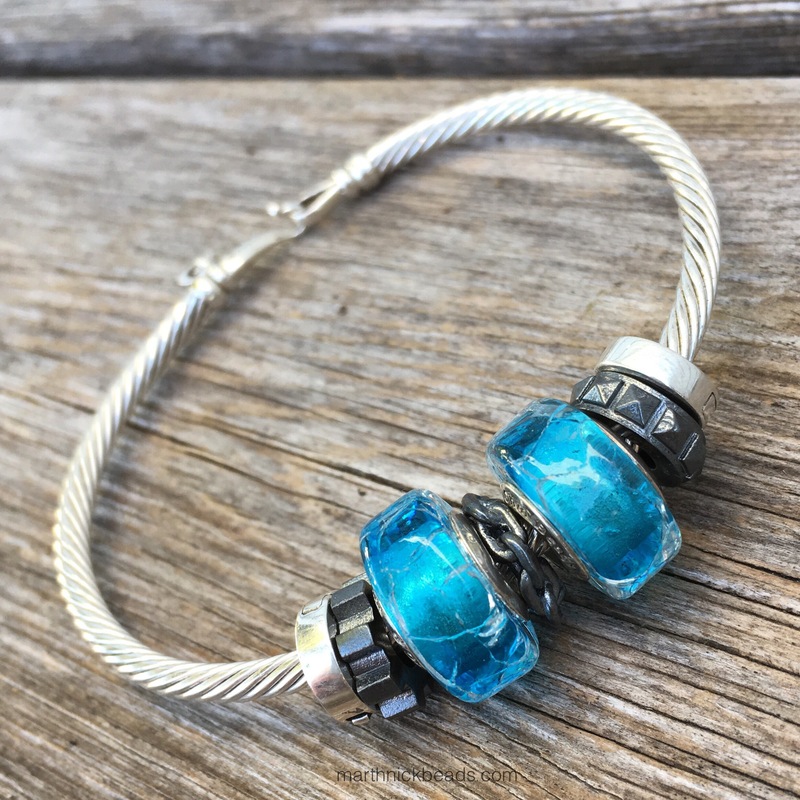 I like the metal look you created and feel the same way about all my lovely glass beads, so would find it hard to keep up that look, but it works! I am working on my Ohm list, but these are not for me, but I think the would make great gifts for a couple of people I know. And that’s the nice thing about Ohm, isn’t it, that the pieces are not for everyone but that’s okay. I so enjoyed listening to Mike at Ohm when he was explaining this to us! I like the chain one! It is true what you said about the size and then when you get it in the mail and its so much smaller, lol! I like that you put them with a variety of beds for comparison. The chain one seems to be popular, I’m thinking! Glad the size comparison is helpful. 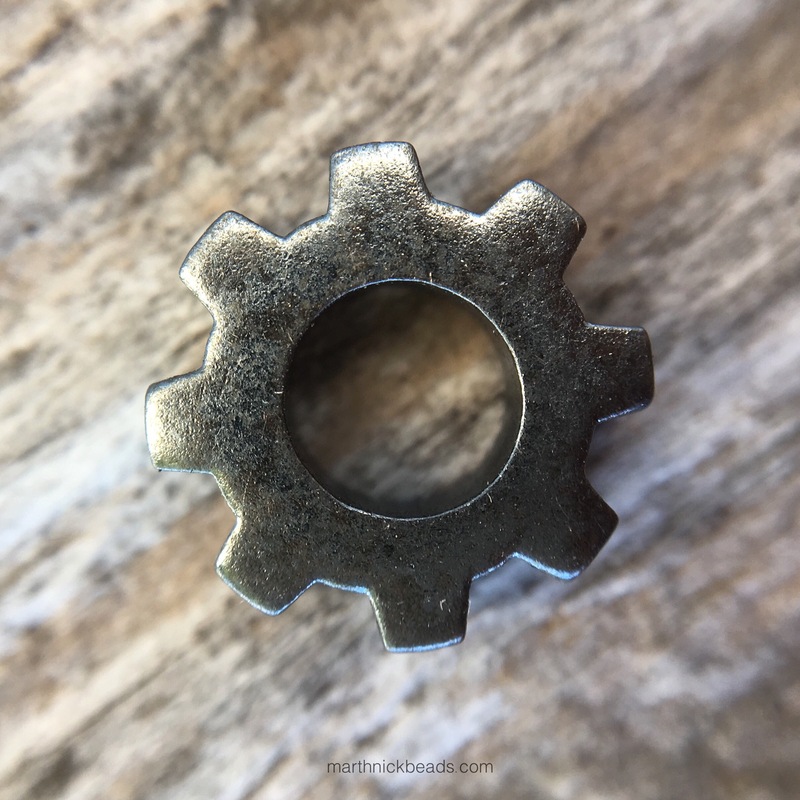 I’m a big fan of steampunk and this collection is perfect for that I think. I really like the idea of a dirty bracelet and was going to use the widget as the focal point but now I think it might be too small. I do like what you did with the As Above and So Below and Chained is a must have for me too. Do you know if there is anything special that needs to be done as far as cleaning the dark pieces goes? Hmm, I’ve had the dirty bangle for a few months and have done nothing to it and it looks pretty new. I will see if one of the Ohm team can answer this for you today, Suzanne. I always like to just go over everything at the end of the day with my Pandora polishing cloth but I think it’s treated with something so I don’t know if I should use it for the dirty bracelet. Yeah, I wouldn’t use a Pandora cloth for the dirty things. (I use Pandora cloths for my beads also). 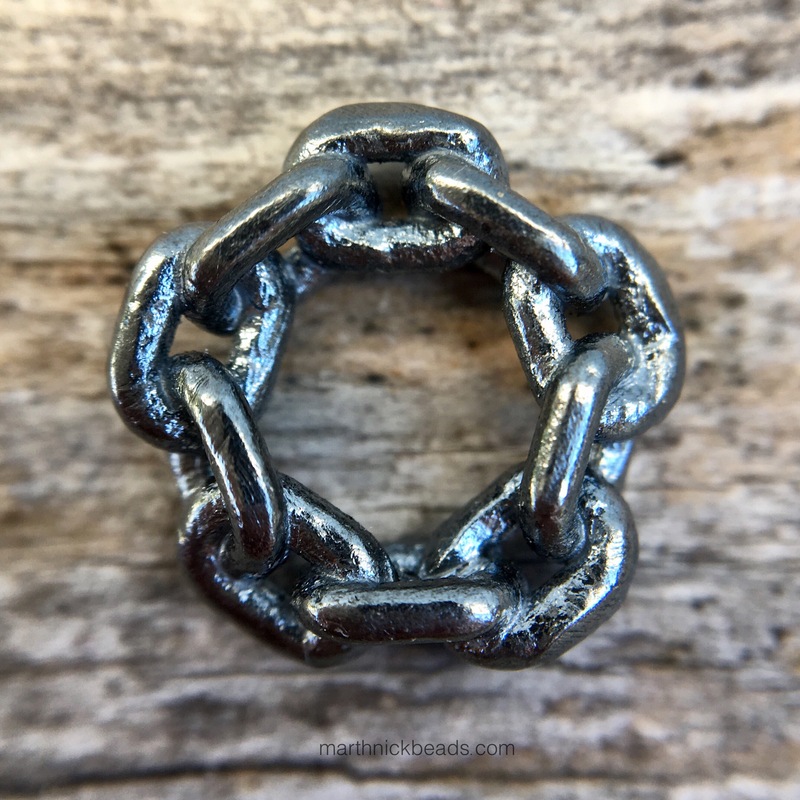 Mike says the dirty finish will fade over time (if you use a treated cloth) but the items can always be re-oxidized by the egg method or by taking it to a jewelry store. I’m pretty sweaty sometimes and just wipe my Dirty Bangle on my shirt every now and then and it really looks brand new. Thanks for checking. I’m glad I asked. Well, here’s another collection I “need” to get! I have definitely blown my so-called budget this month. You’re most welcome. It’s definitely easy to blow a bead budget! Carol, I definitely think that’s your colour!